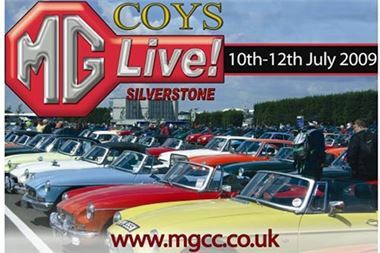 MG Car Club Announces MGLive!, the biggest MG event of the year at Soilverstone circuit 10th - 12th July. The MG Car Club, has announced MGLive!, the new name for its traditional Silverstone International meeting. For the 59th anniversary of the event the Club has created a new action packed event with a range of new features, including an enhanced live arena, to make it the biggest and best event on the MG calendar. With 2009 being the 85th anniversary of the MG car company, MGLive! will dedicate the weekend to celebrating the marque and its achievements through the years. The new MG Motors company, which has recently resumed production of MGs at Longbridge, will display the latest MG TF. For the first time there will be action on the track for the full three days, with races running continuously over the weekend. The MGLive! Arena will feature, amongst its many attractions, the amazing Russ Swift Precision Driving Team including its two-wheeling, spinning, dancing and parking routines. This year they will be demonstrating the versatility of the new MG TF LE500. Overhead the crowds will be entertained by the amazing Blades 4-plane aerobatic team on the Saturday. To mark the 85th anniversary of the marque there will be a display of MGs through the ages from the earliest to the latest with the intention of covering every model ever made. Those wanting a more hands on experience will have the opportunity to take part in the Sunday morning circuit tour or take a trip round the track in an MG ZR. The event also caters for the up and coming enthusiasts with a demonstration of driving skills from the Under 17 Car Club. With a Concours, Pride of Ownership and Gymkhana skills competition there is plenty for all at MGLive!.